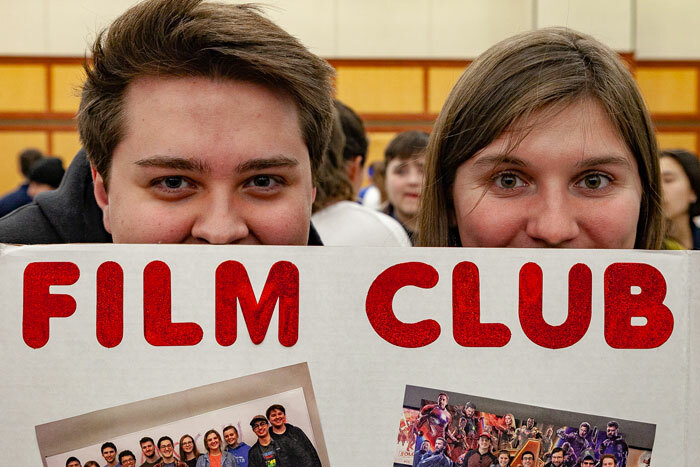 Dickinson's Film Club was one of the many clubs and student activities featured at Activities Night. Photo by Carl Socolow '77. Almost as soon as they step foot on campus, Dickinson College students are encouraged to get involved in many ways—and two events held each semester help them discover which opportunities fit them best. For students looking to branch out into the Carlisle area and beyond through community service, the CommServ Fair offered a slew of opportunities. Like the Activities Fair, the CommServ Fair gave students the chance to match opportunities to their interests and specialties, from volunteering, mentoring and tutoring to helping inmates prepare for a high-school equivalency exam. The event was hosted by the Center for Service, Spirituality & Social Justice (CSSS) and encouraged students to learn more about the three main CSSS service programs, Justice Served, Day of Service and CommServ. Students interact with service groups on campus to learn about opportunities to get involved in the local community. Photo by Carl Socolow '77. Student representatives of the Justice Served program, which combines several initiatives focused on social justice, met with prospective members and discussed on- and off-campus opportunities, including the annual Stop Hunger Now meal-packaging event. CommServ volunteers can choose from more than a dozen weekly service programs, such as America Reads, the Carlisle Tutoring Program, Habitat for Humanity and Keep Hope. These groups build and maintain strong community partnerships through sustained interactions. In 2018, more than 150 students participated in a CommServ weekly community service group. Check out the Facebook photo album of the Activities Fair.